The Fugue cruises to victory in the Prince of Wales's Stakes in record time. In fact the first three home broke the track record. Criquette Head-Maarek on Treve: "When she went down to post I was not pleased with her action... She will go back up in trip"
The Fugue captured the 2014 Prince Of Wales's Stakes in thrilling style when breaking the Ascot 10-furlong course record, with odds-on favourite Treve only third. Her time came to 2m 1.90s in the Group One contest, as against the previous record of 2m 2.52s achieved by Cirrus Des Aigles in the 2011 QIPCO Champion Stakes. She won by a length and three quarters under William Buick from Magician, with Treve another length away. John Gosden, welcoming in the big-race winner for the second day running at Royal Ascot after Kingman's victory in the St James's Palace Stakes yesterday, said: "It's lovely to win the two big races. I actually walked down with the Princess Royal and said there's something interesting about this race - it's all about girl power with Treve and this filly. "It didn't work, the trip to Dubai and training in the winter, but The Fugue has come back. She was like a little bud - she went tight but now she has flowered and she looked great. She won best turned out and I thought that was a curse. "I had to keep Madeleine (Lloyd-Webber) away from William (Buick) because I think that she wanted to make the running and I said that there was a pace-maker. The Fugue got knocked over in the Oaks - she got absolutely creamed and nearly went on the ground. She remains a brave, lovely filly and they are super owner-breeders. They don't have many horses in training and, to have a filly of this quality who can beat the colts, is what this game is all about. "You look at races like the Coral Eclipse and the Juddmonte International. You look at those two races and hope that we have summer weather. The Fugue doesn't like soft ground, with her little feet like a ballerina, so if it's soft we don't run. "The Fugue was in top order today - we didn't have to stop the ferries, the planes and the ports! Full credit to Treve - it was marvellous of them bring her here. I think she is unbeatable over a mile and a half with cut in the ground in the autumn and we would not go near her then. But I thought we had half a chance if we met Treve on good to firm ground over a mile and a quarter in mid-summer - we might do her for a bit of toe. 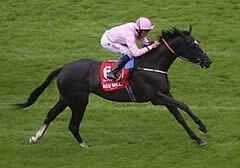 "The Fugue is a five-year-old now and it was very good of the Lloyd-Webbers to keep her in training at five. Horses get all their teeth when they are four and she is now fully developed. She is a powerful and magnificent filly - we are lucky to have her to train. "She was just ready - her last work was spot on and she was cherry ripe. I was training for 10 days hence. You might think that a bit weird but she has just blossomed with the weather. The decision (to come here) was made on Saturday morning. Now we can go for the Nassau Stakes (at Glorious Goodwood) and we could go for the Eclipse (Sandown next month) which comes close but she did not have the hardest of races today and William was under the strictest instructions, not that he needed to be told, that he could flick her - no more than that. She is a filly who will give you all without asking. "It is about class and turn of foot - they both have it and I am lucky to have them. When they are retired, I will be looking desperately for other ones." Lord Lloyd-Webber remarked: "We did genuinely think that we were going to let her have a stroll round the park. Nobody believed that she would quite do this but it's the best racing day in our whole racing career." Lady Lloyd-Webber commented: "She so deserves this. It hasn't gone her way sometimes and this is a very big stage to do it at. Andrew has never seen her win - he is the kiss of death - and I hoped that he would have a cold today and not come! The Fugue has got her recognition as one of the best horses in Europe."